The tailwaters river begins in the higher peaks of Western North Carolina from several tributary streams and unseen branches which merge into two forks that are dammed by Cedar Cliff Lake and Bear Creek Lake. The dam discharges cold water to provide trout with a perfect ecosystem throughout the year. The cold water creates a natural habitat for trout year round and especially through early fall through early summer. The Tuck includes a popular Delayed Harvest section which is approximately 5-7 miles long. This section is familiar with the locals and is stocked with brook, rainbow and brown trout. The delayed harvest section offers anglers the ability to wade for trout in a medium sized river when river levels are down, before the surge of water comes from dam control. Our float trips are the most popular for fly fishing the Tuckasegee. There are two forks of the river – East and West – coming together a couple miles downstream. In these smaller creeks you will find wild browns, wild rainbows and wild brooks. The further upstream you travel the more native fish will be found. On down to the main channel of the Tuck is where some of the bigger fish are typically caught. Common floats are in Slyva and Dillsboro where there are more trout per mile than any other river in WNC. The river provides anglers with shallow eddies and deep pockets for trout to hide. Typically if trout are not rising streamers or wet flies will be used to fish for trout in deeper pockets. If the river is low we recommend fishing for rising fish for an explosive dry fly bite. There are many popular techniques for chasing after trophy trout in the Tuckasegee River. When floating down the river with your professional fishing guide you will find trout rising for dry flies. There are many hatches during these prime seasons, which your guide will show you on any given day. On colder or rainy days streamer patterns work well for imitating a war paint minnow or another baitfish. These types of flies are commonly known to catch trophy fish. Stripping fly line for trophy trout is one of our favorite patterns to use when fishing the Tuck. 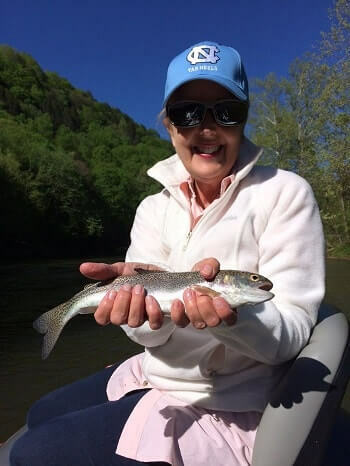 Learn how to fish the Tuckasegee River with our guides while catching trophy trout.